Why Is Health Monitoring Important? Professor Cooper has been associated with the Durrell Institute of Conservation and Ecology (DICE) at University of Kent, UK, since its inception and is now an honorary, visiting, member of its staff. He has lived and worked for nearly twenty years in Africa, Arabia and the Caribbean. In 2009 Professor Cooper returned to Britain after almost seven years as Professor of Veterinary Pathology at the University of the West Indies, Trinidad. He is primarily involved in teaching, diagnostic pathology, comparative medicine, and the veterinary care of wildlife and "exotic" species. With his wife, a lawyer, he teaches at universities in the UK, East Africa and elsewhere overseas and is active in forensic work and consultancies. 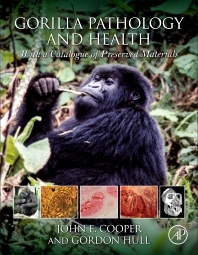 Professor Cooper is an author/editor of many books and papers. Gordon Hull is an amateur naturalist with a keen interest in primates and certain other mammals. He has specialised in the study of gorillas over many years, during which time he has amassed a great deal of technical and historical information about specimens in zoos, museums, and other institutions throughout the world. Out of this world, unreal.